Courtesy of Kim Justice Michael Young met with Gavin Justice-Farmer after seeing video of his young fan's disappointment to the news Young might be traded. "We had a fun time," Young said. "The young fans are the best part of the game." 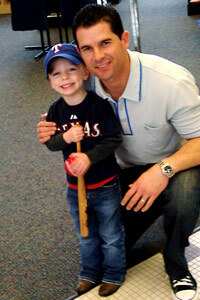 When Michael Young saw Gavin Justice-Farmer's emotional reaction to the news that Young might be leaving the Texas Rangers, the team's captain wanted to meet his passionate 3-year-old fan. Gavin's mother, Kim, videotaped her son as she told him the news that Young might not be with the Rangers anymore. The video, which became an instant YouTube sensation, shows Gavin, sitting at the kitchen table in his Weatherford, Texas, home, taking his Rangers cap and dropping it on the floor while lowering his head in disappointment. It prompted Young, with the help of his wife, Cristina, to organize a meeting with Gavin at the Rangers Ballpark in Arlington's merchandise store last Wednesday, a few days before Young left for spring training. "It was great to meet him. He's a good kid, and we had a fun time," said Young, who bought Gavin some souvenirs. "The young fans are the best part of the game." Young is the father of two boys, 5-year-old Mateo and 16-month-old Emilio. "What 3-year-old gets to meet their baseball idol and hero?" Kim Justice said. "Michael walked in and Gavin expected him to be in his uniform. He asked him, "Are you Michael Young?" He looked at me and asked the same question." Said Young: "He had no idea because I wasn't in my uniform, but I think when he saw an 8x10 [photo in the store], he figured it out."